The average ground temperature around here is 45 degrees. I suspect that on a north facing slope, it might be closer to 35 degrees. A freezer wofati will have no windows, be buried deeper, have a thicker insulation layer, two insulated exterior walls and an 8 inch duct that runs around the wofati through the thermal mass. The idea is that on a regular day, the ducts are plugged. And on a really cold day, you would pull the plugs and open the first door so the mass will be "charged" (yes, according to physics, it is more like the heat is sucked out). The goal is that the temperature inside the freezer is well below 32F all year. The attached pictures leave a lot of stuff out, like the "wings" the umbrella and the earthworks. But it does give a quick idea of what this looks like. Of the two insulated walls, the interior wall should probably drop into the ground a bit. The earthworks around the freezer wofati should be something that draws water away, but attempts to create a frost pocket on the front door. What about aiming for a version based on a classic ice house? Locate it near water, then in winter cut the ice and stack it in for use later in the year. The one intact one I have seen here in the UK was built in a hillside with an uphill door and a downhill door. Ice was cut from a purpose built lake through the winter months and dropped through the uphill side. Later in the year it was emptied from the downhill side. A well insulated structure, based on wofati principals, but also using harvested winter ice would add an extra edge to the system. Could you add a little temperature based gizmo so that if the inside temperature is greater than outside then a fan runs and the cold air is forced inside? Or the vents just open and close automatically, perhaps with a solar chimney for added draft? Gravel floor for condensation/ice melt drainage? I would guess harvesting ice would go against the laziness approach. There's a saying I heard once. If necessity is the mother of invention, laziness is the father. - an umbrella over the structure creating a large thermal mass. Thus allowing us to attempt to set the temperature of that mass. - A more symbiotic relationship with nature so I can be even lazier. So, take advantage of the north facing slope and creating a frost pocket. Also, create using mostly materials found on-site. - And then there is the "f" for "freaky cheap". Gotcha - so steering clear of the need for water, I can't see why this wouldn't work with sufficient depth and insulation. I would guess that the exact implementation would be climate dependant. Here we get maybe 10 days per year where it would be cold enough to "charge" a freezer, pretty much all at night time too. We might manage a year round refrigerator! Another tangential idea... There was some discussion in a thread about trompes for getting chilled compressed air using a water flow with no moving parts. I'd love to see a proof of concept for that using a stream with a moderate height drop. A big enough drop and water flow could probably drive a year round freezer wofati/thermal inertia system. Trompes are very passive systems... setup once and they just keep running. My understanding is that a trompe needs significant fall to get very much pressure, maybe that's only if you want if for shop use. If you want it for refrigeration, maybe a small passive system would be enough. But based on Mollison's lecture on youtbe, you need about 300 feet to get substantial pressure. Unless you have a 3 season waterfall in your woods with substantial flow, your talking about some kind of underground tunnel thing or some kind of structure that leads the flow out so that you can get 300 feet of fall. Even if you have something like a 45 degree slope, that's still 300 feet of structure to lead it out. Maybe I'm wrong on the necessary fall, maybe you could link several smaller systems together. I did some back of the envelope calcs a while ago. A trompe that has a fall of 10m compresses air to 1 bar. Compressing air to 1 bar would double the temperature of it, however it is in contact with cool water, so instead it dumps it's heat back into the water. The air stream loses thermal energy to the water. At the bottom of the trompe the air is allowed to separate from the water, so the thermal connection is lost. The air is piped back to the surface and is still at 2 bar, and at the same temperature as the water. Release the high pressure air through a valve so there is a pressure drop inside the "freezer". The air stream expands back to 1 bar and cools by half it's temperature in kelvin. In practice you would expect a less impressive temperature drop, but I hope you can see the idea here. A steady stream of cold air enters your freezer and over a long period of time lowers the temperature of any thermal mass. You would want to insulate it well as the actual energy removed would be small (air has low heat capacity). A 10 pipe drop for a trompe in hilly terrain is not unreasonable. What remains to be shown is the actual flow rate of compressed air, and hence the degree of cooling, you can achieve. Thank you for clarifying the numbers... I was thinking that the only way you could get a stable 300 ft long/tall structure built on that kind of slope would be a helicopter, after you cleared like 25 ft in every direction. 10x10ft seems much more doable, especially for those who don't have something near the favorable 45 degree soil in the warm months. In keeping with laziness, you could install heat pipes with the heat source end down in the wofati and the heat sink side above ground. The resulting thermosyphon will automatically and efficiently pump heat out of the wofati anytime the outside temperature is colder than inside. Put the inside end(s) into water and let it create ice for you. Who needs to cut and cary ice from the lake? 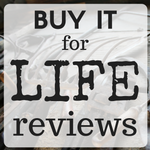 Heat pipes may not meet the low tech + freaky cheap criteria, but this isn't a rich man's technology either. You can make one in twenty minutes with some copper pipe, caps, a torch, and a teaspoon of acetone. For the freezer application you'll need a different working fluid (or pressure)... and now I'm curious what would work... perhaps worth poking around. I suspect this is the kind of thing that Ernie Wisner is already on top of. 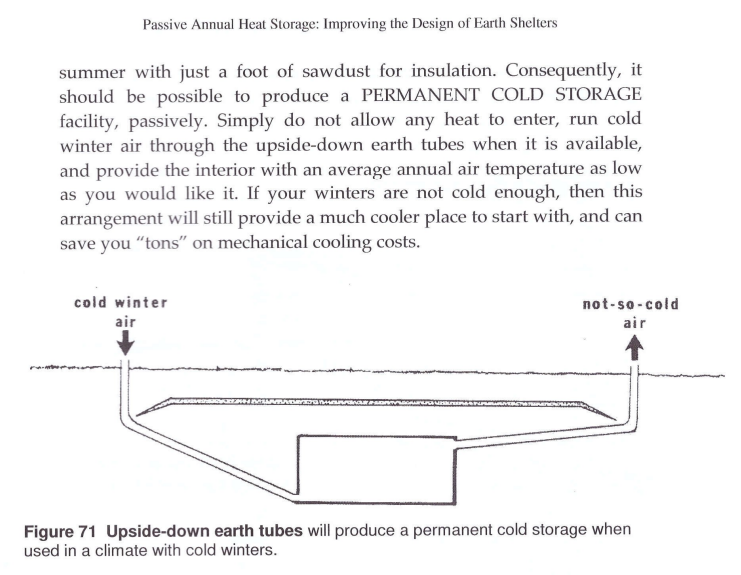 There is a design that looks quite reasonable for a possible freezer in John Hait's book "Passive Annual Heat Storage" which Paul's wofati draws from. No doubt to achieve the potential of "freaky cheap" Paul seems to have removed the air exchange tubes entirely from Hait's design, which seems an important element of the system. At the end of the book he suggests reversing the grade of the pipes to achieve the storage of cold, and it seems brilliant to me. I am hoping soon to build some buildings based on Hait's design, with some nods at the wofati and hope to try the freezer as well, though my climate may be too warm to achieve real freezing. I have serious doubt that this will work. I know, I hate it when people say that about my brilliant ideas, and I often prove them wrong, but... I believe there would be a cheaper way to prove your ideas before you spend a lot of time, labor and money on what will probably end up being a root cellar...unless you are okay with having a large root cellar instead or can re-purpose it as a home or something else. Can the mass you are going to put down there hold a cold enough temperature such that the airspace in the middle will be 20F or less? And how long will that mass hold such a cold temperature? How cold are the walls of an electric freezer? Can you achieve such a temperature with your mass? Research and testing is required. I believe even Michael Cox's ice idea would only keep the room temperature at 31F to 34F which would only make it a refrigerator. I see a problem in getting that cold into the structure when it is cold. 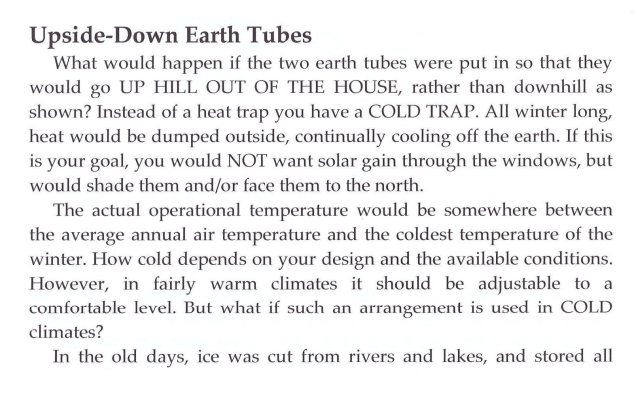 So how about putting earth tubes into the upper portion of the mass, as heat rises anyway, creating a frozen ceiling? Have the tubes twist through it gathering the heat out of the structure and then have the tubes go to a solar chimney to create the draught to make the air flow. On the downhill shady spot with the frost pocket have the air inlet with a greenhouse vent opener set to close it when it gets above say 20˚F. It may have to have a battery powered fan to make the air flow through at night, but that takes away from the simple rugged design. There could be a turbine vent on the top of the chimney to take advantage of wind and let that pull it through, with a bypass for when the temp gets too hot. And about the trompes, the water can go down 300' and then come back up low enough to get the flow so you don't need to have huge drops in elevation to make one work. I don't know if drilling a 300' well would be a possibility but that huge one that was in Colbalt Canada went down 300' and then came back up over 200'. I don't know what the final difference was in elevation but you might need it to be closer than thought to maintain the pressure in the system. They had 120PSI in Cobalt. It would be cool to see one running again or maybe 20 cascading down a hill running one hell of a shop! Back about the time I joined permies I tripped over an article on someone doing something similar. (I failed to bookmark it and haven't found my way back yet so if someone knows where it is I would like to find it again) Theirs was a classic root cellar design with a few changes. The cooling tubes into the dirt were "you" shaped and ran down and under the root cellar so the legs of the "you" were vertical. (sorry the web site won't let me use the letter so "you" stands for its phonetic equivalent) The bottom of the "you" they had put on a slight slope so it generated a heat riser direction to facilitate circulation. The dirt layer over the cellar was thicker than the normal dirt layer and they had buried a layer of foam insulation about half way between the roof of the cellar and the outside world. That layer extended beyond the heat riser pipes. In winter they uncapped the pipes(cap and insulation that inserted in the vertical part of the pipe and opened the doors. The pipes had pool noodles with the core filled with spray foam that were a tight fit down the riser pipes to insulate them that were reinserted when the weather started getting above freezing. In the spring when the days were warming up to much they capped the pipes and build a hay or straw stack over the cellar while the ground was still frozen. That system was apparently running freezing till some time in early Aug. Not year round. There were 3 things I had wondered if they would help enough to give year round freezer. 1. What if the floor was raised steel mesh with a pool below it. Then once the ground itself was frozen solid what if you had a hose so you could add an inch or so of water at a time creating a several ton block of ice below the floor. 2. Second was what about building a freezer inside a freezer. A well insulated smaller room completely inside the bigger. If it had a bunch of built in ice too. (I was thinking lengths of inner tube filled with water and allowed to freeze.) I know that in summer conditions my big camping cooler is good for about 3 days with ice. But I can add another 1 1/2 to 2 days to it if I put the small cooler inside the big cooler and it is well frozen and NOT opened. The inner one doesn't even begin to melt till the outer one is basically fully thawed and because of the double insulation and the cooler outer start it holds longer than it would by itself. I was thinking maybe 4 junked big upright freezers stacked tight together in a square. The walls to the middle would insulate each other and if 1 door open each cardinal direction that would leave room for the doors to swing and keep the whole volume from being opened at any one time. Insulation and shelves for free. 3. What about a wind powered compressor? Either use that air directly or more likely run it through a compounder to get small quantities of extreme high pressure air. Cool that air to outdoor ambient then vent it inside the freezer. Small quanties of 1500 or 2000 psi air might be possible with the right compounder design and they should really reach cold temps. By venting a tiny amount of really cold air the amount of cool/cold air pushed out of the freezer would be minimal. The wind isn't consistent but for this application that doesn't really matter. Anything that keeps it cool longer would help. Okay I saw this and it resparked my imagination (I have been trying to conceptualize a passive freezer for some time) and I think I came up with what is my best idea yet as far as this kind of project goes. So you want your wofati close to home and not limited by access to water, as well as not needing a ton of maintenance. So how about a well buried/insulated wofati near your home that is close to an outdoor cobb oven, but not just any cobb oven. You would build it rocket stove style designed to use all the excess heat into thermal mass, this heat in the thermal mass would be used to run a small simple steam engine (think metal can that you can fill with water that gets hot and vents steam through some duct of sorts) that would power your air compressor for freezing purposes. A) it cools while it cooks, since you will likely be accessing this freezer around when you are cooking it would be a good idea to have it cooled off around then to compensate for heating to due access. C) high laziness tolerance, because you will eat eventually no matter how lazy you are and thusly also cool your freezer down! If you wish it to be a freezer rather than a fridge, then change the ice material from water to something else.... Add antifreeze or salt even. The site for this install has colder winters than the four mile island site so it may be possible for this to work. Note that this person has a valve to cut the refrigerant flow off not for the summer, but to keep his unit from getting too cold so a freezer may not need that. The size of ice block compared to freezer food space/insulation/frequency of access, would take some calculation. The size of the outside in the shade radiator would depend on the number of days below the target temperature. 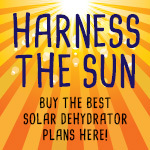 In the above link the user has 300 gallons of water for what looks like a normal fridge size. and seems to have about 6 to 8 feet of radiator. That would be a good starting place. 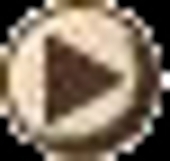 As can be seen from the above link, this is a working solution that someone has used over a number of years. It is merely a matter of adaption to the present use. One note on the physical construction. The door must, for safety, always be operable from the inside. I understand being able to lock the door may be desirable, but the lock should be defeat-able from the inside. Heat tubes work great for cooling applications. They are like a diode for heat -- Heat goes out but it doesn't return. Whenever the air temperature is cooler than the soil temperature they are sucking heat out of the soil. The lowest tech version of a heat tube would be akin to how ice-caves work: holes in the ground with closed bottoms. Natural convection within the tube would lead to hot air rising, and cool air sinking. This effect would happen whenever the ground was warmer than the air. I imagine an array of Vertical PVC pipes. I suppose that if they worked right that eventually they would fill up with frozen rainwater. Perhaps a rain-shield over the outlets would slow that down. The higher tech version would be to use a small amount of working fluid in the tubes like methanol, ethanol, or vodka, and then evacuate the tube so that it boils more readily. We don't have to worry about the tubes over-pressurizing, because they are used in a cooling mode and not in a heating mode. Evacuation can be as simple as heating the bottom of the tube until steam escapes the open top, and then screwing on a cap. In my climate, we have intense radiant cooling at night due to the clear skies. A properly designed heat tube might have a flat horizontal plate on top to take advantage of that. When I measure the difference, it amounts to about 8 F colder than air temperature. You don't need to plug the pipes in summer, because the air in the cold chamber is much denser than the lighter, warm outside air. Therefore, the circuit is automatically "plugged" by the cool air in the chamber when it's warm outside and only "opens" when it's colder outside. Build and forget. Brilliant! The colder it gets, the more the system pumps and stores "coolth". The average temperature then depends on thermal mass and insulation. If you want to freeze food year-round and have some electric power available, just put a regular electric freezer in you cold chamber. It should only briefly kick in like once a day in summer (when your photovoltaics are running full power) and play coolbox through the winter. Plus your food is perfectly safe at thermostat-controlled temperature. It may be worth remembering that a "regular freezer" will not work well in a chilled room. The compressor needs "room temperature" to work efficiently and to last long. This has been discussed in other threads. However, I think the purpose of this thread is to find a way of keeping things frozen without a freezer/power. The cold air intake (in the case of using air as heat transport) should be built so it is below ground level and shaded. See my quick picture below. Note that a way to drain water from the low ground area is needed and the intake should be above ground to avoid water intake. Not only is a rain cover needed, but also a vermin stopper. I don't know if bears would be a problem or not... they would likely need a strong chain link fence or closely spaced trees to keep them out. Well sealed food would help a lot too. (and may be easier) Any fence would have to let air flow through. The freezer does need to be somewhat up the hill, not in a valley where water may collect or ground water will move heat into the freezer area. Sorry, can't find the links. The idea is that while having the outside of the freezer in a cold place is a good idea, having the compressor in a cold place is not. I do not remember what the coolest the compressor should be run at was, but it is above freezing. The compressor gets less lubrication at lower temperatures and apparently compresses less well. So more wear and tear in the compressor. On the up side the compressor should see less use anyway as there is less heat leakage. The second link is about using an air conditioning unit to make a walk in fridge. In that case the compressor will (or should) be on the outside of the cool room. Looking at a refrigeration trouble shooting site... the temperature around the refrigeration line that goes to the the freeze coil can lower the output pressure as well. Here is a link to try: Low Ambient Compressor operation Which gives ideas on how to operate a compressor in low ambient conditions. Remember that a home freezer chest is designed to work within one temperature range and has no way of adjusting to low ambient operation. So deciding if the reduced compressor use over balances the shorter compressor life and any efficiency while running is not something that I have tested... the comments in the first link are generally fairly short term and do have warnings about lubrication as well. Older units seem better built and may have better (and more toxic/poisonous) types of lubricants/refrigerants. Question: "Is it possible to safely operate [...] air conditioners in cold ambient conditions [...]? Answer: Yes and No. [...] Commercial equipment is generally available in two configurations: standard equipment which (similar to residential) is designed and manufactured to operate only at ambient temperatures above 55F (13C), and low ambient options which will allow the equipment to operate year round, even at very low ambient conditions. It then goes on to explain how coolers are designed to cope with low temps. So you are right, it's important to carefully check the specs of the freezer, but if you get your hands on a properly designed unit, no problem at all I would say... Maybe freezers properly designed for staying in a freezing garage are easy to come by in Canada and the northern US? Frere Daran wrote: Maybe freezers properly designed for staying in a freezing garage are easy to come by in Canada and the northern US? Those who live in warm climates are more likely to put them outside so as not to warm the house so much. Those who live in cold climates would never leave their 21C homes to get food out of a freezer. Or so goes the manufacture thinking, would be my guess. Probably it is more that complexity costs, simplicity is cheap, appliances used to be designed well, now they are designed better... they only last 10 years these days. This is the age where people think of the unit as "old anyway" as opposed to "I just bought that thing". But the "old" age is shrinking. I think an important part of the design would be to place the freezer so that heavy tree cover could cast shade over the area or plant quick growing trees to cool the area after construction was complete. Lol, no problem Len This discussion is very constructive (for me at least!) I live in Spain now and plan to move to Extremadura, a province that got its name from its freezing winters and hot summers. So year round natural freezing is not an option, but if I can get my hands on a (2d hand) Beko freezer, that would be perfect for me. Cold room wofati for storing roots, hardy fruit, etc. with a freezer box inside for safely keeping frozen stuff with minimal energy input. The kids are growing and will soon be out of the house, so we plan to move to the mountains in two or three years time, 'doing my homework now to hit the ground running! Paul, I see the 8" duct in your plan from above but not in the side view drawing. At what elevation are you wanting to place the duct? The duct is diagonal. The duct will be about five feet high at the front and about two feet deep at the furthest back. Jesse Biggs wrote: Some initial sketchups... thoughts? Maybe I am missing something, but my first thought is "why above ground?" There may be some reasons such as high water table for that. But I would think that in the case where Insulation is the most important consideration during the hot season, that having the temperature on the outside of the insulation as low as possible would make sense. By lowering the freezer into the ground, the outside the insulation temperature is lowered from as much as 100F to maybe as low as 60F. I am assuming a target temperature of 10F-ish. During the cold season, insulation is less of an issue as at least some of that insulation will be removed on purpose to allow the freezing mass to cool. In this case, I think the mass of the earth around the freezables container will have less effect than the combination of Insulation and phase change heatsink (AKA cooler mass). This is not the same at all as staying warm in the winter where there are numerous extra heat sources to help the earth mass to stay warm even on the coldest days. At least there are warm bodies, lights, cooking and generally some sunlight every day. For a freezer, from the point the outside temperature moves above target temperature, there are only losses to the system. So even though there is snow on the ground, the temperature of that snow and the air surounding may still be warm enough to be adding heat to your freezer. In fact that snow on the ground will act as an insulator keeping the ground from cooling as much as the air above the snow might. It is important to caputure the very coldest times to sink heat away from your phase change material. I honestly don't think non-phase change will work... but I could be wrong, enough dense mass could work. Water becomes more insulative after freezing as it no long thermocycles, so lowering water's freezing point with some kind of aniti-freeze like salt or alcohol (not automotive anti-freeze please) would help. Add the right amount and you have phase change below target temperature... I am not sure if that is totally true the water part itself may still phase change at 32F. In any case the water would still release heat at the same rate and collect cold quicker. Some one with a better understanding of phase change in alloys might know more. Maybe staging would be helpful. Think in layers. Start with ground temperature (~60F), then insulate, have large ground mass that may be able to hold it's temperature at 50F or a little less, inside, insulate and use water as the mass, let it freeze but not get too cold and use this as the fridge. Inside the fridge, more insulation and antifreeze treated water for mass, this is your freezer. This is greatly simplfied as there is the transfer of heat from the feezer to the outside air in winter to figure out still. Also the fridge may be best in the layer just outside the ice room so the earth mass keeps it from freezing. What does this gain over just really thick insulation? Aside from double use (fridge/freezer), it allows mass to be used as part of your insulation which is cheaper easier to use/maintain. Earth is not a great insulator, but it does act as a good time delay... it takes time (months) for heat to get from one point to the next. Ice, even though it may still be warmer than target, also takes time for heat to transverse. Insulation is just temperature differential across R. All of these layers would be chilled during winter, but the earth mass because of it's time delay would probably never get to freezing, the ice would go below freezing, but not as much because once it freezes it doesn't transfer heat at as fast a rate either. That is an excellent start! And, as Len pointed out - a freezer wofati sits deeper into the ground than a house wofati. So here's a couple of shots of a sketchup of a freezer wofati design. It seems to me like it would be beneficial to have a set of berms to each side of the wofati that are just off contour sloped towards the wofati to act as frost catchers increasing the effective frost pocket that the wofati is using. The opening would need to be on the uphill side. That's one of the strong points of the wolf body design which of course is based on oehler's design. I agree... The slopes to the south of the dances with pigs Meadow would be a perfect place for this.